British music invasions usually come in fits and spurts. Every 10 years or so a band crosses over to the American mainstream market and makes the world sit up. Lately though, there seems to have been a steady flow of British talent gaining credible exposure in the US. Whether it’s a lack of competition, a more receptive audience or just the recognition that the UK has some top-quality performers, the timing couldn’t be better for British acts hoping to sell out US arenas. Here are some hot new artists currently being introduced to US audiences…and remember where you heard about them first! The New York Times recently featured weighty reviews of Jessie Ware’s debut album ‘Devotion’ (which has been shortlisted for a Mercury Prize) and AlunaGeorge’s latest single ‘Your Drums, Your Love’. Both acts hail from London and flaunt an electronic soul vibe. 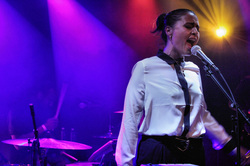 The NY Times describe Ware’s music as ‘sensuous and stirring’, comparing her to Lisa Stansfield whilst vocalist Aluna Francis from AlunaGeorge has a chillier style, who’s vocals are labelled as more ‘nasal and punchy’. Discovered on Myspace and born in London Lianne is a singer/songwriter who's career is blossoming simultaneously in the UK and the US. She's already made her US debut on 'The Late Late Show With Craig Ferguson' this week and recently performed at the Bowery Ballroom in New York. 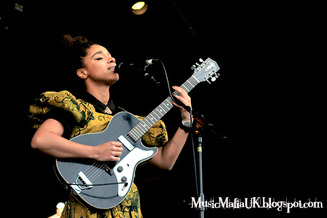 The soulful guitarist will also be opening for John Legend across the US from next month. Her latest single, 'Is Your Love Big Enough?' debuted this week at No. 1 on Billboard's Heatseekers Albums chart and No. 142 on the Billboard 200. Looks like she's ready to fill the gap Adele has left to have a baby! Another heavyweight publication has put their stamp on a collection of emerging female MC’s from the UK. Billboard magazine spotlighted 7 lady rappers they claim we should ‘keep an ear out for’. It’s a respectable list of established and rookie talent most of whom US rap fans have probably never heard of. But that’s the beauty of these spotlight lists - somewhere in your consciousness the names are stored for future recognition. With a practically non-existent female market in the States, these ladies have more of a chance than ever before to make a name for themselves. With less of a distinctively British style, this band has been quietly infiltrating the American musical arena for a while. A number of their tracks have been licensed as soundtracks to a variety of US shows and films, including their hit song ‘How You Like Me Know’. The single has been featured on ‘Entourage’ and ‘Community’, a Super Bowl car ad and during President Obama’s re-election campaign. Not bad for four guys from Bath. Funky, soulful and with tinges of James Brown and Curtis Mayfield-like vocals the band, who’s new album is called ‘The Glorious Dead’, are touring North America now.